A Blog to Keep You and Your Eyeballs in the Know! Home / Archive by category "A Blog to Keep You and Your Eyeballs in the Know!" As you have probably seen via email, we are giving our staff and doctors the week of Christmas off. As such, we will be closed starting at 1 pm on Saturday 12/22 and will re-open at 9 am January 2nd! Thank you to our staff for all of their hard work, and a big thank you to all of our patients, it has truly been our pleasure to take care of you and your eyes this past year! This past Wednesday our office was out to support the Tustin Unified School District by participating in their annual health fair. Our table had a jeopardy-style game to earn raffle tickets. Watch the video below to see the winner! If your name is Paul and you participated in the raffle, check your text/email to see if you won! Sorry for the extra step, but we didn’t announce the last name because we couldn’t read it! Thank you to all who came out and had some fun with us! Tired of hearing our office staff answer the phone “Welcome to Dr. Broady and Dr. Elson’s office, my name is _____, how can I help you”? Good, because we are tired of making them say it too! This is one of many reasons we are going to be updating the name of our practice. We have been laboring over this for quite some time now, and have narrowed it down to two options that we are pretty split on. Given that your opinion is the one that matters most to us, we would really appreciate your help in making the final decision. If you have a moment, we would greatly appreciate your input via the form below. Thank you for your help and we will definitely be sending out an email with the winning name once it is determined! 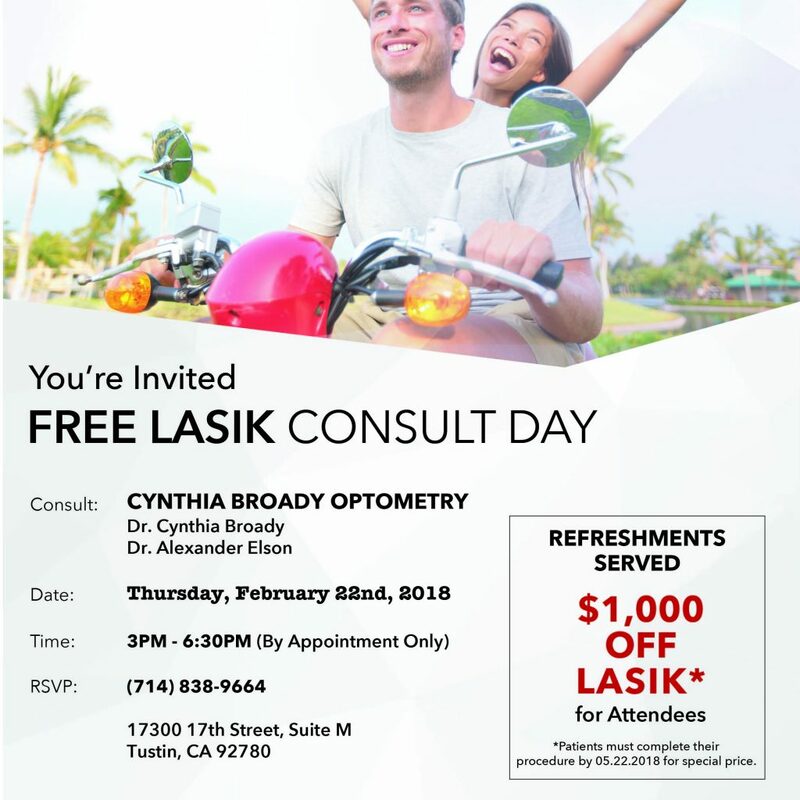 LASIK Consult Night – Thursday February 22nd! Thanks to the success of our first LASIK Consult Night, NVISION has agreed to provide another FREE consult night at our office next month. The date is Thursday Night February 22nd, and the offer is $1,000 off full custom LASIK, which includes NVISION’s lifetime commitment. 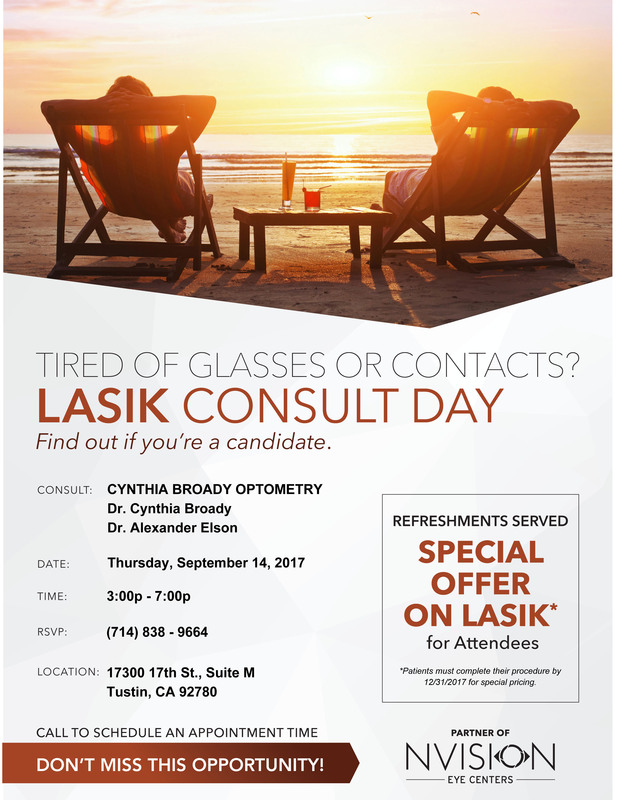 If you have ever had questions about or considered having LASIK this is the perfect opportunity to find out if you are a candidate and answer any questions you may have. If you are tired of reading glasses, this is also a great opportunity to find out about the different refractive surgery options to reduce your dependence on those pesky readers! Appointments have been filling up even faster than our last event, so give us a call today and we’ll make sure a spot is reserved for you! 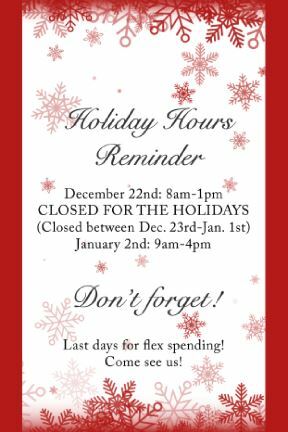 We are closed for the holidays and will resume normal business hours on the January 2nd! Should you have an urgent need, please call the office phone and you will be provided with Dr. Elson’s cell phone number. Dr. Elson will work with you to help make sure you are taken care of. As always, if you are having a medical emergency, we would urge you to seek care at the emergency room if able, or call 9-1-1 if unable. No, your eyes have not deceived you. Now through the end of 2017, Essilor (the nation’s leading lens manufacturer) has a promotion that offers buy-one-get-one FREE lenses. The details of the program are actually quite simple. In order to be eligible for the free lenses, you must purchase one set of lenses with all the bells and whistles: Crizal anti-reflective coating, Transitions technology (clear lenses that change color in sunlight), and either a Varilux Progressive lens OR Eyezen anti-fatigue lens. If you purchase one pair of lenses with all of these options, we will be able to get you a second pair of lenses of equal or lesser value for FREE! 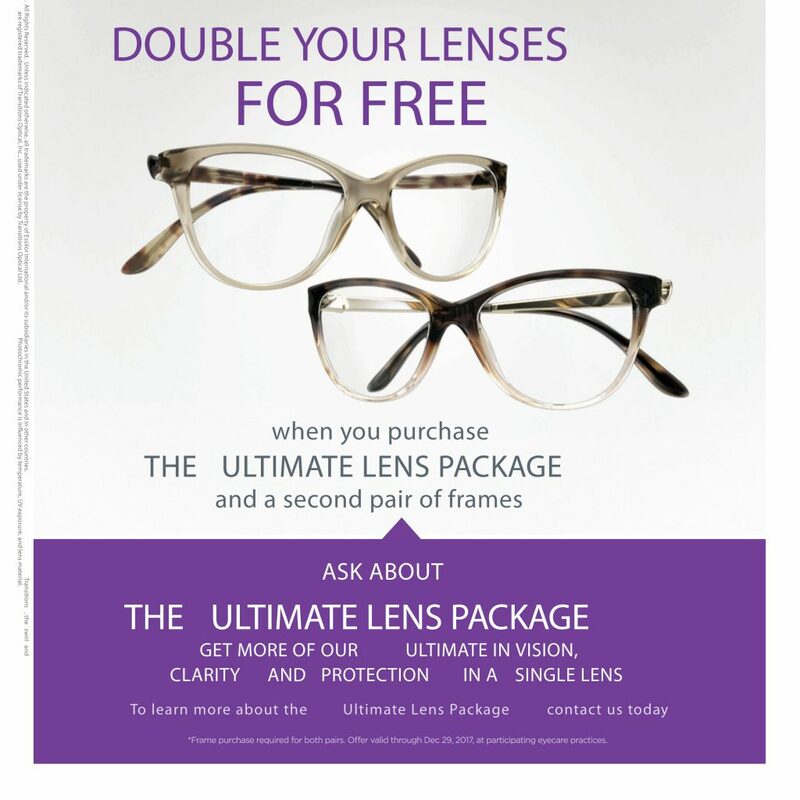 The other stipulation included in the promotion is that both sets of lenses need to be put into frames that are purchased at the same time, which basically means they want to make sure that you are not putting their new lenses into an old frame. It is a truly amazing deal that ends December 29th, so hurry in and we’ll get you set up with two new pairs of glasses so that you can look your best for the holidays! As always, if you have any questions, you can swing by the office or give us a call and one of our incredible staff members will be happy to answer any and all questions you might have. Congratulations to those of you that were able to take part in our first ever Lasik Consult Night, and thank you for helping to make it a smashing success! Quite a few of you are now well on your way to being glasses and contacts free, and we are happy to have been able to work with our partners over at Nvision to be able to get you an exclusive deal on LASIK. If you are reading this and are a little jealous because you could not attend, NOT TO WORRY! The event was such a success that we have begun talks with Nvision set up another consult night and another promotion for Spring of 2018. Seeing as our first night was so popular, if you would like to have the first opportunity to schedule for our next Consult Night, you can give us a call and add your name to the list. Once a date is set, we will give you a call and get you scheduled before we send out our promotional materials for the event. Thank you again to all who made our first Nvision Consult Night such a so great, and we look forward to helping even more of our wonderful patients in the future! Nvision LASIK Consult Night – September 14th! We have partnered up with Nvision to provide our patients with a special offer on LASIK as well as a convenient, in-office consultation! What is the special offer you might be wondering…? Well there is a simple answer for that: $1,000 off full-custom, all-laser LASIK! If you have thought about LASIK, but never had a consultation, or if you just want to know more about the different types of laser surgeries and see if you’re a candidate, call to schedule an in office consultation on our special LASIK Consultation Night on Thursday, September 14th! We are pleased to publish our new website and newly founded blog! Our blog will be used to update you on happenings in our office as well as on issues that relate to you and your eyes out in the real world. Thanks for tuning in and check back for regular updates to keep yourself in the know!